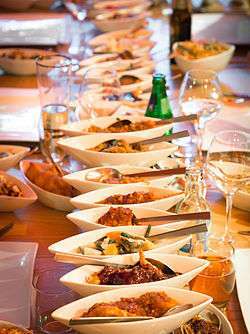 This is a list of rice dishes from all over the world, arranged alphabetically. Rice is the seed of the monocot plants Oryza sativa (Asian rice) or Oryza glaberrima (African rice). As a cereal grain, it is the most widely consumed staple food for a large part of the world's human population, especially in Asia and the West Indies. It is the grain with the second-highest worldwide production, after maize (corn), according to data for 2010. Arroz borracho Puerto Rico Rice cooked with sazón, sofrito, chickpeas, ground meat, and beer. 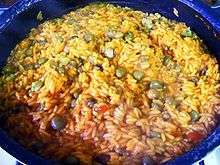 Arroz con gandules Puerto Rico A part of the Puerto Rican gastronomy consisting of a combination of rice, pigeon peas, olives, capers, and pork, cooked in the same pot with Puerto Rican-style sofrito, spices and annatto oil. 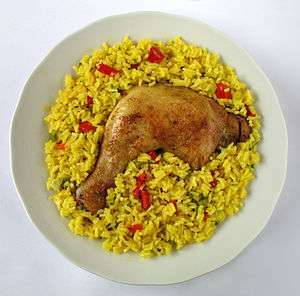 Arroz con pollo Spain "Rice with chicken", the dish, which originated in Spain as a form of pilaf, is a staple throughout Latin America. It is a traditional dish of Latin America and the Caribbean, especially in Puerto Rico, Colombia, Venezuela, Ecuador, Panama, Peru, Cuba, Costa Rica, Honduras, the Dominican Republic where it is called locrio de pollo, and Saint Martin where it is called lokri or locreo. Baghali polo Iran This is rice with lima beans and dill. Bánh chưng Vietnam This is a cake-dish usually eaten on Tet, Vietnamese new year eve, which is pork in the center, mashed pea and rice wrapped in leaves. Ba-wan Taiwan This is a savory snack food made from rice paste, meat, and usually shiitake mushrooms and bamboo shoots. It is often found at Taiwan night markets. Also called "rou-wan-zhi." 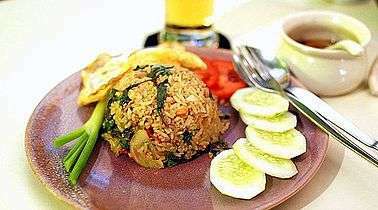 Bi pong moun Cambodia A rice and egg dish. Several variations exist. 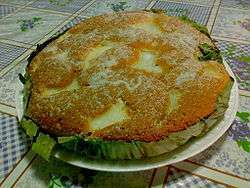 Bibingka Philippines A rice cake. May be topped with cottage cheese, salted egg or freshly grated shredded young coconut meat. Biryani South Asian Preparation of oily spicy rice with meat, fish, chicken, and vegetables. Bisi bele bath Karnataka A rice-based dish with its origins in the state of Karnataka, India. Bisi-bele-bhaath translates to hot lentil rice in the Kannada language. The traditional preparation of this dish is quite elaborate and involves the use of spicy masala, toor dal (a type of lentil) and vegetables. Spices like nutmeg and asafoetida, curry leaves and tamarind pulp used in its preparation contribute to the unique flavor and taste of this dish. 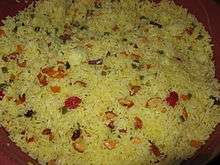 Bhat Bangladesh, India, Nepal, Pakistan Rice that has been cooked either by steaming or boiling. 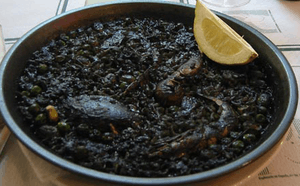 Cabidela Portugal Rice with chicken or rabbit meat. Chimichanga Mexico and parts of southern United States This is a deep-fried burrito most commonly made with rice, cheese, machaca, carne adobada, or shredded chicken, and folding it into a rectangular package, and deep-frying. Chitranna India This is a rice preparation made by sauting groundnut, sesame seeds, red chili and turmeric in oil and adding it to cooked rice and mixing. 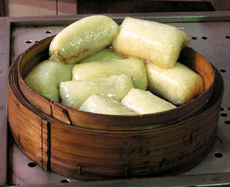 Ci fan tuan Shanghai (China), and Taiwan Prepared by tightly wrapping a piece of youtiao (fried dough) with glutinous rice. 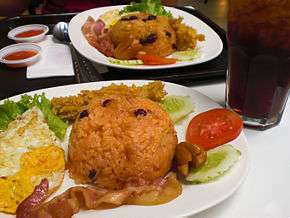 Claypot chicken rice China, Malaysia and Singapore This is a rice dish served with sliced chicken, salted fish, Chinese sausage and vegetables. 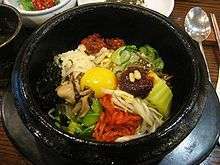 The rice is cooked in the claypot first and the cooked ingredients are added in later. Some places serve it with dark soya sauce. Traditionally, the cooking is done over a charcoal stove, giving the dish a distinctive flavour. Cơm tấm Vietnam A dish in Vietnamese cuisine made from rice with fractured rice grains. 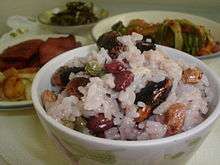 Tấm refers to the broken rice grains, while cơm refers to cooked rice. Congee East, South, and Southeast Asia A type of porridge. 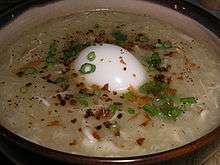 Sometimes called "rice congee" but often simply shortened to "congee." 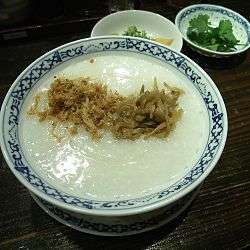 There is a large variety of congee in Hong Kong and it is eaten very frequently as a staple food. The base is made by boiling rice then letting it simmer for a long time. Different ingredients are added depending on the region. The length of the simmering also varies by region. Cantonese congee is generally cooked longer for a smoother texture. Coriander rice South Indian Easily made by using boiled rice, coriander paste, oil, chana dal, cumin seeds, jeere, lemon juice and salt. 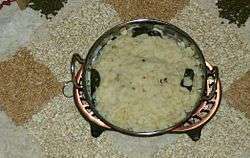 Curd rice India Simple preparations are a mixture of boiled rice and yogurt. More complex variations also exist. Curry rice Japan, and also popular in other parts of East and Southeast Asia Although curry is often eaten with rice in many countries it is seen as a main dish. The Japanese karē raisu (lit. 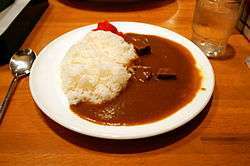 "curry rice") though, is a standard combination of rice with a British influenced Japanese curry, of which there exist several types. Dolma Armenia, Azerbaijan, Turkey, Middle East Eggplant, Zucchini, peppers, onion or tomatoes stuffed with rice. Dosa India Rice and lentil pancakes with origins in Udipi, Karnataka. 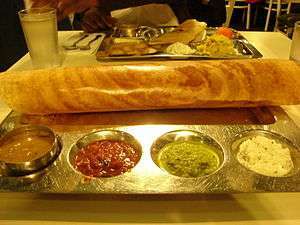 Popular breakfast dish in South India. Étouffée Cajun, Creole cuisine Found in both Cajun and Creole cuisine, Étouffée is typically prepared with shellfish over rice. The dish employs a technique known as smothering, a popular method of cooking in the Cajun areas of southwest Louisiana. Fried rice (Philippines) Philippines Day old rice fried in oil with a lot of garlic, usually eaten for breakfast with dried fish, egg and tomatoes. Gai fan China, Taiwan Cooked rice covered with another dish. 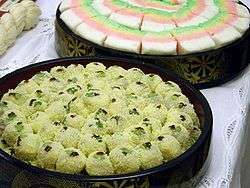 Glutinous rice cakes E.g. 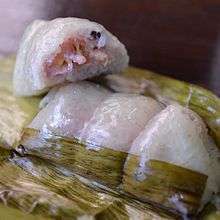 mochi (Japan), Ddeok (Korea), tangyuan, niangao, zongzi (China), and many varieties of Thai and Laotian cakes. Goto Philippines Thin rice porridge cooked with strips of ox-tripe, ginger, onion, garlic, and garnished with spring onions and calamansi. Gumbo Cajun, Creole Considered a soup but served over rice. Hainanese Curry Rice Singapore A Singaporean rice dish consisting of steamed white rice smothered in a mess of curries and gravy. 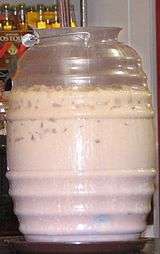 Horchata Mexico Sugared rice milk. Idli India Steamed rice cakes, made with lentils or other pulses. Pictured is idli along with ramekins of sambar and a ramekin of chutney in the center of the dish. Turkey, Iskilip - Corum Very specific rice food. It takes almost a day to prepare and cook. Cooked for several hundred years only in Iskilip. 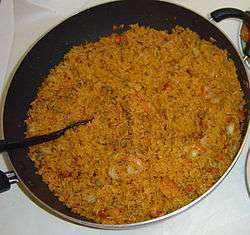 Exremely traditional and rare..
Jambalaya Cajun, Creole Meat-seafood-vegetable stock to which rice is added..
Jíbaro Puerto Rico Yellow-rice cooked with annatto oil, sofito, and spices with a fried egg on top. Jiu niang China This is a sweet dish made from fermenting sticky rice with yeast. This can be eaten alone steamed, or is added to other foods. Jollof rice West Africa tomato and pepper based stew to which rice is added and boiled in, and usually served with chicken, salad and fried plantain. Juk Korea Generic term for porridge made from rice. There are many different varieties. 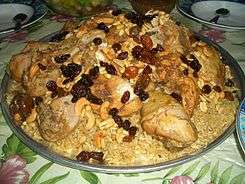 Kabsa KSA, Jordan Rice (usually long-grain, mostly basmati) cooked with meat, spices and vegetables. 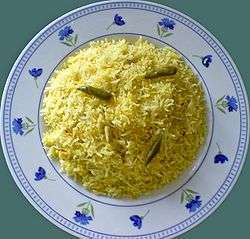 Kateh Iran A simple sticky-rice dish from Mazandaran and Gilan. Kande Pohe India A simple flattened rice dish from Maharashtra usually eaten as breakfast. Katsudon Japan A bowl of rice topped with a deep-fried pork cutlet, egg, and condiments. Kedgeree Anglo-Indian Flaked fish (usually smoked haddock), boiled rice, eggs and butter. 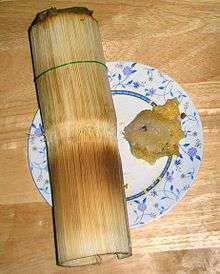 Ketupat Indonesia, Malaysia (Also called Lontong) - Rice wrapped in coconut leaves weaved pouch, boiled and serve with other food such as Satay, vegetables, fried chicken, curry, etc. 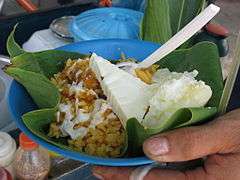 Khao kan chin Thailand A northern Thai dish of rice that is mixed with pork blood and steamed inside a banana leaf. It is served with cucumber, onions and fried, dried chillies. Khao khluk kapi Thailand Rice is fried with shrimp paste and served with sweet pork, sour mango, fried shrimp, chillies and shallots. Khao lam Thailand Glutinous rice is boiled or steamed with sugar, and sometimes other ingredients, in a section of bamboo. Most often eaten as a snack or dessert. 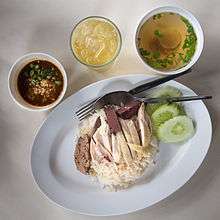 Khao man kai Thailand The Thai version of Hainanese chicken rice, it is made in a slightly different way than the original and served with a very different dipping sauce made from fermented soy beans, garlic, ginger, and bird's eye chilies. Khao mok Thailand The Thai version of a biryani, it is typical of Thai-Muslim cuisine. Khao tom mat Thailand A traditional Thai dessert made from sticky rice, coconut milk, and bananas. It’s usually wrapped in banana leaf or coconut leaf. Kheer Bangladesh, India, Pakistan Sweet dish of rice cooked in milk, dry fruit and sugar. Cooled before serving. Lemang Indonesia, Malaysia Glutinous rice with coconut milk cooked in bamboo stalks over open fire. 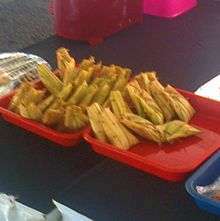 Traditional dish of the Minangkabau people accompanying Rendang. 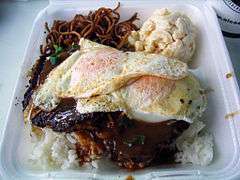 Loco Moco Hawaii, United States A bowl of rice topped with a meat patty and gravy, and with a sunny side up egg on top. Lokri Saint Martin Rice, bite-size pieces of chicken, mixed vegetables, spices (also called locreo or locrio). Loobia Polo Central Iran Green beans rice with tomato paste, meat and other spices, cooked in. 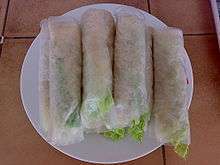 Lumpia Philippines Spring rolls wrapper made from rice flour. Maifun Asia This is a category which includes both dry and in-broth rice vermicelli noodle dishes. 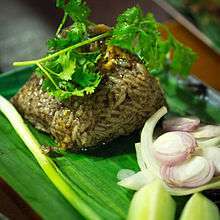 The specific dish is usually named after its non-vermicelli ingredients or its preparation. E.g. "Cao mai fun" = panfried maifun and will usually have a protein such as pork or chicken, and seasonings (usually green onion). 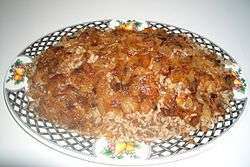 Mandi Yemen Rice cooked with meat (lamb or chicken), and a mixture of spices. 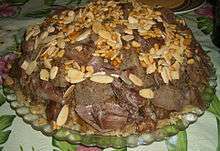 Mansaf Iraq, Jordan, Palestine, Saudi Arabia and Syria Rice is cooked separately, lamb meat is cooked in a sauce of fermented dried yogurt and served with rice or bulgur. Maqluba Middle-East Consisting of rice and eggplant or cauliflower casserole that is then turned upside down when served. 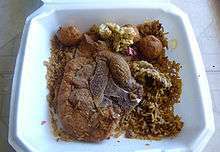 The dish can include fried tomatoes, carrots, potatoes, cauliflower, eggplant and chicken or lamb. When the casserole is inverted, the top is bright red from the tomatoes that now form the top layer and cover the golden eggplant. Moa'amar Rice with milk and chicken soup. A sort of rice made by adding milk and chicken soup to the rice and letting it into the oven. Eaten instead of white rice. Very popular in Egypt. Mont di Myanmar A thin rice noodle dish, a semi staple dish of Rakhine State. 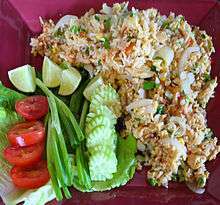 Rakhine Mont de is either a salad with dry roasted conger eel and chili or as a soup. Mandalay mont de is with larger rice noodles, with meat based sauce. Mont Lin-ma-ya Myanmar Literally Husband and Wife or Couple Snack. It is a fritter made with rice flour, where two halves (thus 'Couple') are fried with quail eggs, steamed garden beans, spring onions. The halves are then connected and sprickled with salted roasted sesame. Mosaranna Karnataka, South India Curd rice, considered a staple food of brahmins of the Karnataka state of South India. 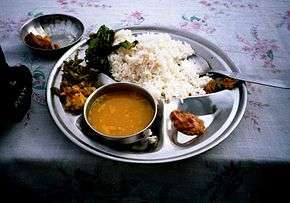 In this dish, curd is added to cooked rice and eaten straight away. Sometimes mustard seeds, red chillies, curry leaves and lentils are fried in oil and added to the dish. To add more flavour, ginger-garlic paste and finely chopped red onions are also added to the yogurt and rice mixture. Fresh, finely chopped cilantro is used as garnish. 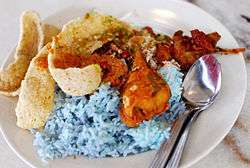 Nasi Campur Indonesia, Malaysia (Literally "mixed rice" in both Indonesian and Malaysian; in addition also called nasi rames in Indonesia) refers to a dish of rice topped with various meat and vegetable dishes, peanuts, eggs and fried-shrimp krupuk. 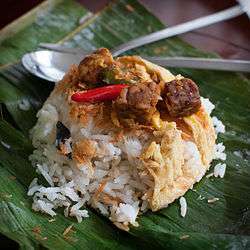 Nasi Dagang Malaysia, Indonesia Rice steamed in coconut milk, fish curry and extra ingredients such as fried shaved coconut, hard-boiled eggs and vegetable pickles. 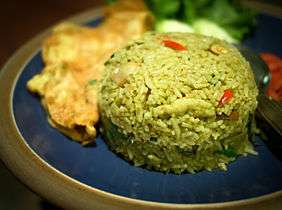 Nasi goreng Indonesia, Malaysia This is type of fried rice usually cooked with shrimp paste, chicken, meat, salted fish or/and vegetables. Nasi kandar Malaysia Famously served by local Indian Muslims, and very popular in Penang. Nasi Padang Padang city, West Sumatra, Indonesia Steamed rice served with various choices of pre-cooked dishes, it is a miniature banquet of meats, fish, vegetables, and spicy sambals eaten with plain white rice, it is Sumatra's most famous export and the Minangkabau's great contribution to Indonesian cuisine. Nurungji Korea a traditional Korean food made of scorched rice. After boiling and serving rice, a thin crust of scorched rice will usually be left in the bottom of the cooking pot. This yellowed scorched state is described as 'nureun' (눌은) in Korean and nurungji derives from this adjective. 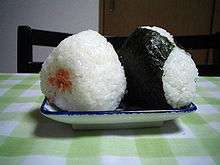 Onigiri Japan Short grained rice formed into balls with or without savory fillings, a popular snack. 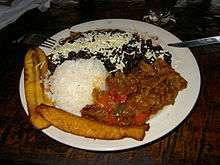 Pabellón criollo Venezuela Rice, shredded beef and stewed black beans. 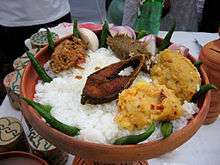 Panta bhat A lightly fermented rice-based dish consumed in Bangladesh and the eastern Indian states of West Bengal and Assam. Pilaf Bengal, Iran, Turkey Rice cooked in a seasoned broth. 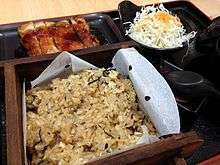 In some cases, the rice may also attain its brown color by being stirred with bits of cooked onion, as well as a large mix of spices. Depending on the local cuisine, it may also contain meat, fish, vegetables, and (dried) fruits. Pongal India Sakkara pongal:A sweet rice dish, cooked with rice, moong dhal, jaggery and milk, flavoured with cardamom and garnished with cashew and raisins. Ven pongal: rice, moong dhal, milk, salt, pepper corns, ginger, cummin seeds and curry leaves. 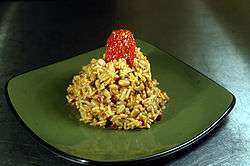 Puliogare India Or tamarind Rice is rice seasoned with Tamarind. Puso Cebu, Philippines Rice filled inside a pouch made with woven strips of coconut frond then boiled. 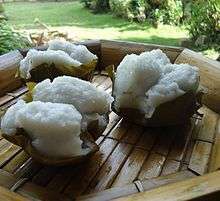 Puto Philippines A pudding made from stone-ground soaked rice, sugar and often with coconut milk then steamed. Various toppings such as cheese, salted egg, or minced meat may be added. Puttu Kerala, India Pictured is puttu and kadalakkari. 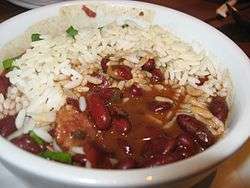 Red beans & rice New Orleans, United States Staple made with kidney beans, ham bones, pickled pork, andouille sausage, onion, celery, bell pepper and seasonings. 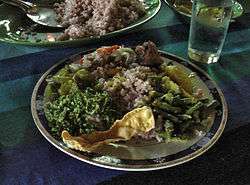 Rice and curry Bangladesh, Southern India, and Sri Lanka A meal of plain, spiced, or fried rice which is served together with several other dishes, of which at least one is a curry, on one plate, but sometimes with the other dishes on the side. Rice-A-Roni United States Pilaf-like boxed food mix that consists of rice, vermicelli pasta, and seasonings. Rice bread Bread made from rice flour. Rice congee East, Southeast, and South Asia Also called Rice Porridge - a watery rice gruel eaten with various additions or side dishes. Rice Krispies United States A breakfast cereal made of crisped rice. Rice Krispies are also used to make Rice Krispies treats by combining the cereal with melted marshmallows. 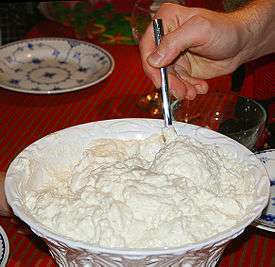 Rice pudding Worldwide Sweet dish of rice cooked in milk, coconut milk or other thickening liquid. Eaten with various spices, fruits, condiments, etc. in different regions. Risotto Italy Rice dish made by first frying in butter after which broth is added. 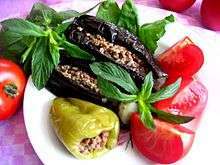 Sarma Turkey, Azerbaijan, Armenia Grape or cabbage leaves stuffed (rolled with) rice, various herbs and spices. 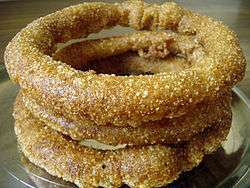 Sel roti Nepal Ring shaped bread made from rice flour and eaten during Hindu festivals, especially Tihar. Serabi Indonesia An Indonesian pancake that is made from rice flour with coconut milk or just plain shredded coconut as an emulsifier. Each province in Indonesia has various serabi recipes corresponding to local tastes. 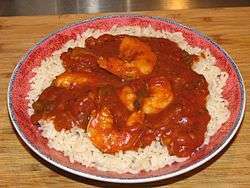 Shrimp Creole Louisiana Creole cuisine Cooked shrimp in a mixture of whole or diced tomatoes, the Holy trinity of onion, celery and bell pepper, spiced with Tabasco sauce or another hot pepper sauce and/or cayenne-based seasoning, and served over steamed or boiled white rice. Sinangag Philippines Variant of fried rice made with garlic. Stir fry Pictured is Thai Phat naem sai khai, sausage of rice-fermented raw pork skin stir fried with egg. 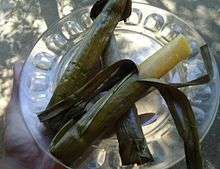 Suman Philippines Sticky rice cooked with coconut milk and sugar and wrapped in banana or coconut leaves. Tangyuan China, Taiwan A traditional (at least from the Ming dynasty) food that is made from glutinous rice paste that has been rolled into small balls, boiled, then put into a soup base. These are traditionally white in color like the moon and eaten during the first full moon after Chinese New Year and symbolize togetherness of family. They are also often pink, or a mixture of pink and white balls, because red signifies good luck in Chinese culture (but red dye added to the white results in pink). Sometimes savory or sweet stuffings (such as red bean paste) are added. 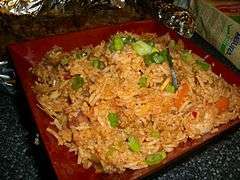 Thalassery biryani Also known as Malabar biryani, Thalassery biryani is a rice-based dish made with spices, rice (khyma rice, and not basmati rice) and chicken (specially dressed for biriyani). 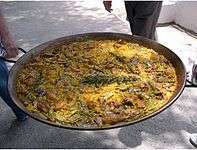 Variations upon the dish may use mutton, fish, eggs or vegetables. Yabra' Middle East, Turkey Grape leaves stuffed with rice and cooked with vegetables. The dish name differs from one country to another. Yakimochi Japan Literally grilled or broiled mochi or pounded rice cake. Traditionally, it is prepared using a small charcoal grill but in modern times a gas grill can be used. During the time of the Autumn Moon it is traditional to eat fresh yakimochi while sipping sake and enjoying the view of the full moon. 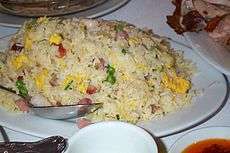 Yeung Chow fried rice A popular Chinese-style wok fried rice dish in many Chinese restaurants in China, the Americas, Australia, United Kingdom, Vietnam, and the Philippines. The ingredients vary, but there are staple items such as cooked rice (preferably day old because freshly cooked rice is too sticky, barbecued pork, Cooked shrimp, scallions (spring onions or green onions), chopped, including green ends and egg yolks. Zeera rice India Steamed rice, Zeera (cumin), Zeera powder, ginger-garlic paste, salt, oil, chana dal and red chillies. Zereshk Polo Qazvin Province, Iran This is caramelized barberries sprinkled on plain buttery basmati rice and served usually with chicken. Zosui Japan A rice soup made from pre-cooked rice and water. Leftover soup from nabe is often re-used for zosui. ↑ "ProdSTAT". FAOSTAT. Retrieved December 26, 2006. ↑ Rivera, Oswald (2002). 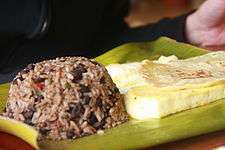 Puerto Rican Cuisine in America: Nuyorican and Bodega Recipes. 9781568582443. p. 186. ISBN 978-1-56858-244-3. ↑ Elisabeth Lambert Ortiz (9 September 1998). Cocina latinoamericana. EDAF. p. 251. ISBN 978-84-414-0421-2. Retrieved 9 August 2011. ↑ Alice L. McLean (30 August 2006). Cooking in America, 1840–1945. Greenwood Publishing Group. p. 139. ISBN 978-0-313-33574-7. Retrieved 8 August 2011. ↑ Robert M. Weir; Karen Hess (March 1998). The Carolina Rice Kitchen: The African Connection. Univ of South Carolina Press. p. 39. ISBN 978-1-57003-208-0. Retrieved 8 August 2011. ↑ Kellie Jones; Amiri Baraka; Lisa Jones; Hettie Jones; Guthrie P. Ramsey (6 May 2011). EyeMinded: Living and Writing Contemporary Art. Duke University Press. p. 285. ISBN 978-0-8223-4873-3. Retrieved 8 August 2011. ↑ D. H. Figueredo (16 July 2002). The complete idiot's guide to Latino history and culture. Penguin. p. 250. ISBN 978-0-02-864360-1. Retrieved 8 August 2011. ↑ Thanh Nien Hot Spots 5 Jan 2012 "With your craftsmanship in hand, return to Saigon for a master class in clay-pot cooking, crafting cơm tấm (broken rice), caramelized pork belly,"
↑ Meera Freeman The Flavours of Vietnam 2004 - Page 42 "Cơm tấm - broken rice.. 3 cups broken rice water vegetable oil (optional) Rinse the rice in plenty of cold running water until the water is clear and the rice is free of impurities. 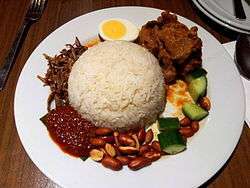 Put the washed rice in a large saucepan ..."
↑ "Padang's Feast Fit for a King". Eating Asia. 2006-07-10. Retrieved 2013-08-20. ↑ Irma Rombauer; Marion Rombauer Becker; Ethan Becker (1997). Joy of Cooking. p. 519. ISBN 0-684-81870-1.